The global E. coli testing market is decently competitive, mainly as six key players held about 57.0% of total shares in 2016, observes Transparency Market Research on the basis of a recently published report. With new players entering the market on a regular basis, the vendor landscape has become substantially fragmented in recent times. Extensive focus on developing improved testing methods, launching innovative technologies, and regulating service costs are three key strategies implemented by most players in the global E. coli market. Capitalizing on new trends and opportunities in several regions has caused many players to gain a competitive edge over others. Participating in valuable mergers & acquisitions to take over small, regional players also are other key strategies implemented by several companies in the E. coli testing market. Alere Inc., Dickinson and Company, BioMerieux Inc., NanoLogix, Inc., Meridian Bioscience, Inc., Thermo Fisher Scientific, Inc., Becton, Bio-Rad Laboratories, Inc., CPI International, Inc., Pro-Lab Diagnostics, Inc., and DEXX Laboratories, Inc., are prominent players operating in the global E. coli testing market. 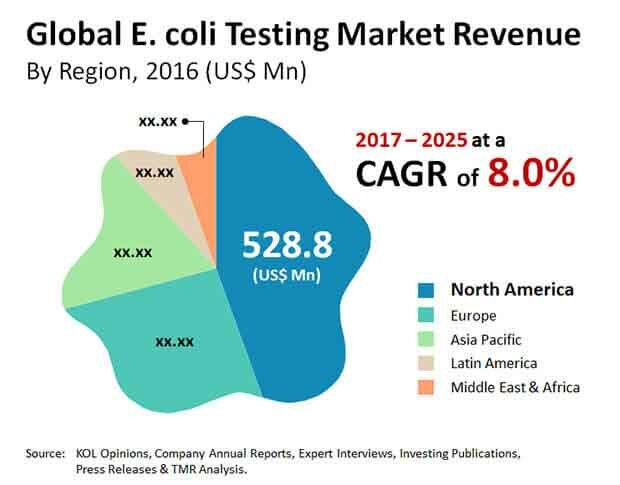 The global E. coli testing market was valued at US$1.18 bn in 2016 and is projected to rise at an impressive CAGR of 8.0% from 2017 to 2025. Expanding at this pace, the opportunities in the market is anticipated to reach US$2.36 bn by the end of the forecast period. The E. coli bacteria commonly grow in hospital and community-based environments. The bacterium can be easily acquired by anyone spending substantial time in such spaces. Un-cleanliness kept in these environments causes the bacterium to further mushroom with regards to its spread. Thus, a lack of cleanliness and a general disregard of maintaining hygiene has been chiefly responsible for driving the global E. coli testing market. Rising concerns about anti-microbial resistance acquired by those affected is also driving the global E. coli testing market, by triggering extensive research on the bacterium, especially with regards to its resistance power. In contrast, notable susceptibility of the bacterium against penicillin and amoxicillin antibiotics has made drug vendors expand research and drug production activities to tackle E. coli outbreaks. However, high costs of E. coli treatments is notably hampering the E. coli testing market, mainly by discouraging those having less disposable income. Many underdeveloped and remote regions depict a lack of healthcare experts, consequently restraining the market’s growth. Nevertheless, extensive research and innovations are being carried out by several players, and this is expected to reduce the restraints up to a certain extent. Capitalizing on new trends and opportunities in several regions has caused many players to gain a competitive edge over others. The E. coli bacteria commonly grow in hospital and community-based environments. The bacterium can be easily acquired by anyone spending substantial time in such environments.